This is the story of a by-gone era of entertainment. Before cable television and video, people packed auditoriums to see travelogue films hoping to learn about places they wanted to visit and relive memories of past trips abroad. At its peak, there were thousands of live-lecture travelogue film series in the United States and Doug Jones was one of the stars. He gave over six thousand travelogue lectures, all of which he narrated live from the stage. He got to his shows by flying his own twin-engine Cessna, logging over three thousand hours in the air and sixty coast-to-coast flights. Growing up in Kansas City, he traveled the world on his father’s flight privileges as a Trans World Airlines engine inspector. College trips took him to Bangkok, Bombay, London, Cairo, Honolulu, Paris, Hong Kong; all the destinations TWA flew, and he put himself through university playing banjo in Kansas City jazz clubs. Over four decades he shot film in sixty-eight countries, sailed around the world on the Queen Elizabeth 2, and traveled on every form of transportation. His film The Great Canadian Train Ride drew sell-out crowds in auditoriums and theaters and sold over 1,000,000 copies on home video and DVD. This new memoir, with 40 photographs, covers a remarkable life story and includes an array of observations about everything from world travel to Broadway, aviation to show business, and the many different relationships and colorful people he has known. It is told with honesty and humor: a life well lived. Travel Videos from All Over the World! Travelogues in the Classic Tradition. Scroll down to see all ten titles. As a boy growing up in Kansas City, veteran travelog producer Doug Jones would have had little reason to expect to see much of the world. But because of his father's job he had the opportunity to travel the globe from a young age. Harold Jones was an engine inspector for Trans World Airlines, the legendary airline of Howard Hughes, which traveled the world from its home base in Kansas City. Doug Jones' earliest travels were to Los Angeles on the Lockheed Constellation, the elegant four-propeller airplane designed to meet Hughes' dreams of transporting passengers high above the weather. As a college student at The University of Missouri at Kansas City, Doug traveled on the Boeing 707's. TWA Flight #1 started in Kansas City and went to Hong Kong - the long way around, eight stops and twenty-six hours. This early exposure to the world was the reason that he began producing travelogs in 1968. Over four decades later he has produced a visual travel memoir of his forty years filming the globe. AROUND THE WORLD - ONE MAN'S JOURNEY is a retrospective of a lifetime of travel by one of America's best-known travel filmmakers. Drawn from over one half-million feet of motion picture film, shot on six continents and in 60 countries, the film follows a circuitous route around the globe stopping in the best known travel destinations. The film shows the changes in the world and the changes in photography as well. Highlights of the film include The Taj Mahal, The Kamakura Buddha, The Pyramids, The Treasures of Tutankhamen, The Eiffel Tower, Big Ben, The Berlin Wall, Iguazu Falls, Machu Picchu, Carnaval in Rio, The Great Wall of China and the Glaciers of Alaska. Destinations as diverse as Hollywood to Hong Kong, Moscow to Brunei, Tokyo to the Amazon are featured in this very personal film. In 1934 The Cunard Line launched the Queen Mary. It was the largest ship of its time and it set a new standard for ocean liners of the era. In 2004, the fourth Queen to sail under the Cunard flag was launched, The Queen Mary 2. At 150,000 tons she is the longest, tallest, widest, biggest ocean liner of the world. And to commemorate the launch, Cunard sent the Queen Mary 2 on a voyage to Rio de Janeiro for the largest party on earth, Carnaval. Doug Jones, one of the foremost producers of travel films today, was onboard to produce "Sailing Down to Rio - on the Queen Mary 2." The voyage duplicates a legendary journey of the S.S. Normandie that was done in 1939. The historic journey remains among the most remembered voyages of the 20th century. The new Cunarder, Queen Mary 2, repeats the experience. 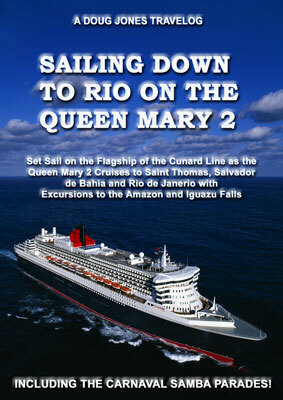 Sailing from Fort Lauderdale, QM2 stops in St. Thomas, the Virgin Islands then sails to the equator and the Southern Hemisphere arriving at Salvador Bahia. Along the way you will travel inland to the Amazon and on to Iguazu Falls. QM2 arrives in Rio just as Carnaval begins. From the beautiful white sand beaches at Copacabana and Ipanema to the cable car ride to Sugar Loaf and the cog train to the Christ Statue atop Corcovado, Rio is like no other city on Earth. And you'll see the magic of Carnaval, throngs of people dancing in the streets and the spectacular samba parades Rio is world famous for. The film lets you see the wonders of this great new vessel. Meet the Commodore and visit the bridge. See the engine control room of this new hi-tech ship and meet the Chief Engineer. QM2's Executive Chef will take you through the largest floating galleys of the sea. See the lavish shows and peak into the deluxe suites. Relax on the decks and enjoy activities as varied as art auctions and planetarium lectures and meet some of the 1400 people who make up the international staff. All this and much more are featured in this new 90-minute, feature-length film. Join Doug Jones, one of America's foremost travelog producers, on the most spectacular long haul rail journey of the world! 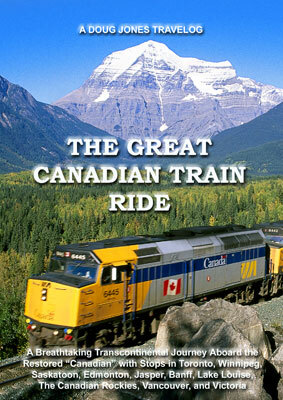 In 1955 the Canadian Pacific inaugurated the "Canadian", a new train designed to offer the ultimate in rail luxury. It was then, and remains today, one of the longest rail journeys of the world. After years of constant use, VIA Rail took on the daunting task of completely restoring all the original 1855 stainless steel equipment including the bullet lounge Park Cars, the observation dome cars, the dining cars and bedroom cars. The newly restored equipment was then put back into service on the beautiful northern route of the old Super Continental. The result of this giant project is captured in this film. You'll see footage of the original laying of the tracks at the turn of the century, early steam trains crossing the prairies, film of the original 1955 Journey of the "Canadian" and you'll visit the yards in Montreal today and watch the historic rolling stock being restored. You'll also tour Toronto, visit the Royal York Hotel, watch the train being prepared for departure, and join in the excitement as this great transcontinental train leaves westward on a truly spectacular journey. You'll meet the bedroom stewards, the conductor, have "dinner in the diner", sleep in a rolling bedroom, ride in a locomotive and see all of the behind-the-scenes operations of this great train. You'll also visit Winnipeg, Saskatoon, Edmonton, Jasper, Lake Louise, Banff, Kamloops, Vancouver and Victoria. You'll see the most breathtaking scenery on earth from the comfort of one of the greatest trains in the world. The brand new, feature length film will take you back to a bygone day when "the going was good." So come aboard, sit back and relax and experience a beautiful and intriguing journey on board the new "Canadian" with Doug Jones as your guide. Europe - the Grand Tour! It is the dream of travelers worldwide to see the sights the world knows best: Big Ben, the Eiffel Tower, the Colosseum. 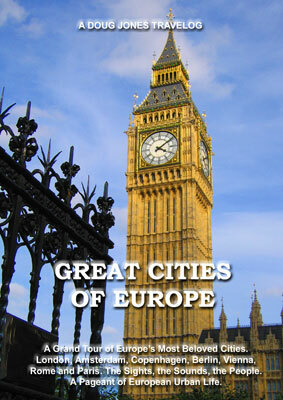 And for travelers, Europe most often means its cities. For in the hum of the traffic and the noisy chatter of the cafes Europe comes to life. Doug Jones, one of America's best known travelogue producers, takes you on a grand tour of Europe's most beloved cities. From the Changing of the Guard at Buckingham Palace, to the quiet canals of Amsterdam, from the fun of Tivoli Gardens in Copenhagen to the drama of the Berlin Wall, from waltzing in Vienna to a Papal Mass in St. Peter's Square and a night in Paris, Europe's great urban life comes alive. The film transports you between cities by train and you'll see Europe's great rail network first hand. London, Amsterdam, Copenhagen, Berlin, Rome and Paris all receive a thorough look in this film of Europe's greatest cities. Join Doug Jones, one of America's premier travelog producers, as the QE2 sets sail for a voyage "down under" to New Zealand and Australia and experience three of the world's most popular travel experiences - the sweeping panorama of Australia, the majestic scenic spectacle of New Zealand, and the last of the Super liners the one and only Queen Elizabeth 2. Explore Rotorua, New Zealand's geothermal world of geysers, mud pots and steaming lakes and cliffs. See Fiordland National Park and Milford Sound with their incomparable beauty. Fly in a sky plane to the Tasman Glacier and experience the glory of Mount Cook and the Southern Alps. Visit Auckland, Christchurch, Wellington and Queenstown. Enjoy the T.S.S. Earnslaw Steamer, the Kingston Flyer Railroad and a jet boat on the Shotover River. Experience the welcome Australia gives as the QE2 sails into Sydney Harbor where the Opera House, Harbor Bridge, koalas and kangaroos await. Visit the Australian Island State of Tasmania, visit a sheep station while shearing is underway. See Perth, the Pinnacles, and experience an unforgettable trip to the "center" as Alice Springs and Ayers Rock beckon you to explore the mighty outback. QE2 sails New Zealand and Australia tells not only the story of these two amazing lands but also the story of one of the world's greatest liners, the 67,000 ton, thirteen story high, 964 foot long Queen Elizabeth 2. Take a behind-the-scenes look at life aboard the ship from the bridge and the engine control center to the largest floating kitchens in the world. 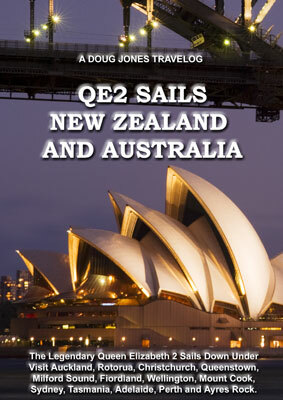 So join the crowd, step aboard and set sail in style to the Lands Down Under as Doug Jones takes you to New Zealand and Australia aboard the one and only QE2! In 1969 the legendary Queen Elizabeth 2 was launched as the third of the Cunard Queens. She was the first ship ever built to serve as both a transatlantic liner and a cruise ship. Cunard sailed her across the North Atlantic for 35 years until she was replaced by the Queen Mary 2 in 2004. 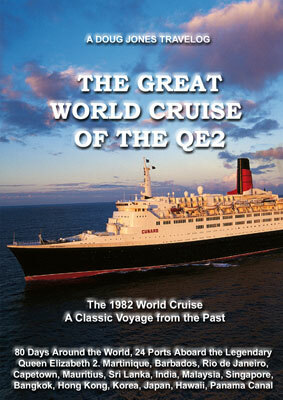 In 1974 the QE2 made her first World Cruise. She has continued to sail around the world each winter ever since. Each year she takes a different route but each world cruise will sail through a large part of the great far east. Doug Jones, one of America's premier travel film producers, boarded the QE2 halfway through her World Cruise in Sydney Australia. He sailed with her for 40 days through the most exotic ports of the Orient to produce a new film, CRUISING THE ORIENT ON THE QE2. The film begins in Sydney Australia. The QE2 sails from Sydney on to Melbourne and Perth before heading to Bali. From Bali the ship continues on to the exotic island nation of Brunei. From Brunei, QE2 sails to Manila and the Philippines. Then the ship makes its way to Hong Kong, where we travel overland to Xian and Beijing. The next stop on the Orient cruise is Tokyo and the wonders of Japan. 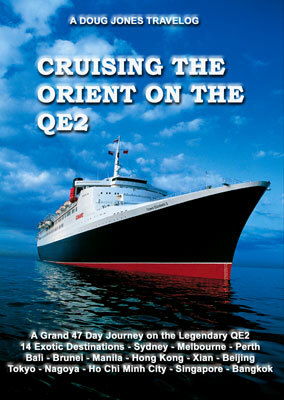 Then QE2 heads back to the South stopping in Vietnam, Thailand, and Singapore. This film gives a glimpse of life in some of the most interesting travel destinations of the world. You will also see sights ranging from the Sydney Harbor Bridge to the Great Wall of China, from Balinese dancers in Indonesia to crocodile wrestlers in Thailand. And the experience will take place from the gangway of one of the most legendary liners of all time; Cunard's QE2. Join Doug Jones onboard his favorite ship as you travel the Orient enjoying the luxurious experience of the QE2 World Cruise. Join Doug Jones, America's premier travelog producer, for a romantic coast-to-coast adventure aboard three of America's greatest trains. You'll depart New York City's Pennsylvania Station aboard the fabled Broadway Limited heading to Philadelphia, Pittsburgh, and points beyond. At Chicago 's Union Station, the legendary CaliforniaZephyr with its hi-level Superliner sleepers will depart west, rolling across the prairies, through Denver and into the heart of the breathtaking Rocky Mountain range. At Salt Lake City the Desert Wind departs out over Utah toward Las Vegas and the California deserts as you make your way to Los Angeles. You'll also tour New York City, Philadelphia, Pittsburgh, Chicago, Denver, the Rockies, Salt Lake City, Las Vegas and Los Angeles. You'll experience America from the great cities of the East to the heartland prairies;from the majesty of snow capped mountains to the haunting deserts of the West. 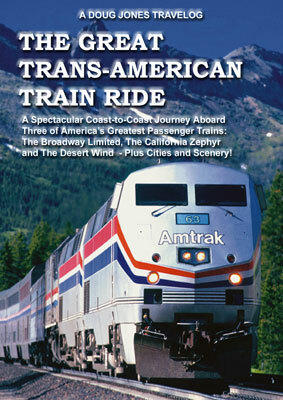 The Great Trans-American Train Ride will take you from "Sea to Shining Sea" on a romantic, nostalgic journey aboard the last great passenger trains of the U.S.A. as the sweeping panorama of America unfolds across 3,000 miles of silver rails. So pack your bags, grab your camera, and join Doug Jones as you step back to a bygone day when movie stars and Kings, G.I. 's and adventurers all traveled together on America's greatest trains. The Pyramids - The Sphinx - Cairo - The Temples of Luxor - The Nile - Karnak - Abu Simbel - Aswan - Alexandria - The Suez Canal - Mosques - The Treasures of King TutWelcome to EgyptJoin Doug Jones, one of America's premier travelog producers, on an intriguing journey through a mysterious land.In the 5th Century B.C., Herodotus, the Greek father of history, made a journey across the Mediterranean to the ancient land of Egypt. He marveled at the pyramids, gazed across the lifeless desert then looked at the fertile Nile Valley and made the statement "Egypt is the gift of the Nile. 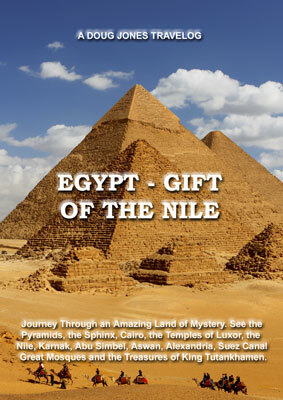 "On the basis of this theme, Doug Jones takes you through this exotic and timeless land.See the pyramids and the sphinx and hear the story of their construction. Visit the farms of Egypt and see how time has truly stood still. Wander through the Valley of the Kings, visit Luxorand Karnak and see archeological wonders that are unrivaled on earth. Feel the pulse of the bazaars, visit the great museums, journey into the desert to visit a Coptic monastery and explore the great mosques of Cairo. Ketchikan - Juneau - Skagway - Glacier bay - College Fjord - Anchorage - Midnight Sun Express - Fairbanks - Prudhoe Bay - Denali National Park - Mt. McKinley - Columbia Glacier. The Great Land - Alaska! The name brings to mind a thousand images: majestic mountains, rivers of ice, endless tundra, vastness, spaciousness, freedom. All of these images are true. But for today's traveler it also means luxury. Amid some of the most rugged scenery of the world, luxurious cruise ships and elegant trains carry travelers north to the top of the world to view the extraordinary sights of the "Last Frontier." In THE GREAT ALASKA CRUISE, Doug Jones takes the viewer through the Inside Passage and across the Gulf of Alaska on the fabled Island Princess of Love Boat fame. 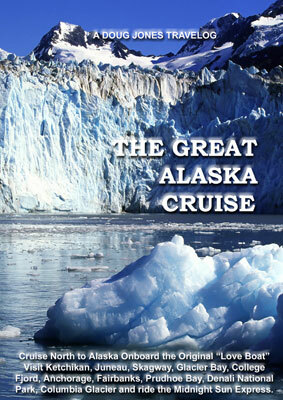 Join 600 passengers fro a trip from Vancouver to Ketchikan, Juneau and Skagway. Experience the thrill of a helicopter trip to the Juneau icefields, ride on the White Pass and Yukon Railroad, see a salmon cannery in operation, sail through breathtaking Glacier Bay and College Fjord and experience all the magic that has beckoned travelers to Alaska for over a hundred years. Visit Anchorage, the Matanuska Valley, stop by the Alaska State Fair, take the Midnight Sun Express to Fairbanks, ride the "Discovery" sternwheeler paddleboat, pan for gold at the Little Eldorado Mine, and visit the Seismolgy lab of the University of Alaska. Then further north on the gravel Dalton Highway, past the pipeline, to Coldfoot, the northernmost truck stop in the world, flightseeing over the Brooks Range at midnight, then over the tundra to Prudhoe Bay, the oil fields and the Arctic Ocean. From the Arctic, travel to Denali where you'll discover the magic of Mt. McKinley from the air then travel back to Anchorage and reboard the ship for a final trip south through the breathtaking icefields of the Columbia Glacier. All this awaits onboard the Island Princess as Doug Jones takes you north to the top of the world in THE GREAT ALASKA CRUISE. Welcome Aboard! Join Doug Jones, America's premier travelog producer, on the cruise of a lifetime as the one and only Queen Elizabeth 2 sets sail from New York harbor on an unforgettable 80 days journey Around the World. 24 of the world's most exotic ports of call await you on this magical trip. You'll leave New York City for a warm weather cruise that will take you south to Miami, Martinique, and Barbados, over the equator to Salvador and fabulous Rio, across the South Atlantic to Capetown and the exotic island of Mauritius, then on to Sri Lanka and the ancient capitol of Kandy. 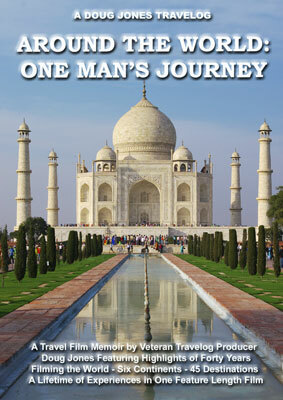 Next India and the Taj Mahal, then Malaysia, Kuala Lumpur, Singapore, Bangkok, Hong Kong, and Korea. Tokyo and Japan await, then six days across the Western Pacific to Honolulu, on to Los Angeles, down to Acapulco, through the Panama Canal, next Cartagena and Curacao, then back to New York City. And all of this awaits amid the unparalleled luxury of the QE2, the last of the superliners, 67,000 tons, thirteen stories high, 964 feet in length, carrying 1,500 passengers and a crew of a thousand, QE2 is a marvel unto herself. See the behind-the-scenes story of the last of the truly regal liners. Step onto the Bridge, meet the Captain, explore the engine room, peek into the galleys, and make yourself at home aboard this City of the Sea. Purchase all 10 Doug Jones Travelogs - 15 hours of travel all over the globe! 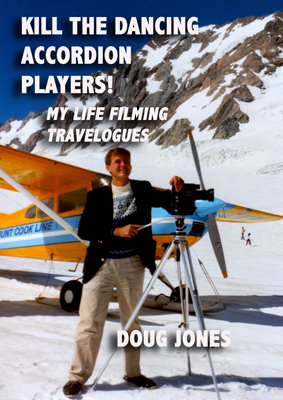 Doug Jones has been producing travel films for most of his life. He was born and raised in Kansas City and graduated from the University of Missouri at Kansas City with a degree in Radio and Television Broadcasting. Today he lives in Los Angeles. Doug comes to the travelogue business from a varied background. He has worked as a professional entertainer, a radio announcer, a European tour guide, an art dealer and a theatrical producer. His personal travels have taken him around the world and into nearly seventy nations on six continents. Doug has produced eighteen feature length travel films. He has appeared on virtually every important auditorium lecture series in the United States and Canada including the National Geographic Society series at Constitution Hall in Washington, D.C.
Doug Jones' films have been released on home video and DVD and include "The Great Canadian Train Ride" with over one million copies sold worldwide. He operates an active stock footage business and his material is regularly seen in prime time television shows and national commercials. In addition to his work in producing travel films, Doug is an avid pilot having made over 40 solo coast to coast flights in his twin Cessna airplane. Doug Jones is a member of the Society of American Travel Writers. He is past president of the International Travel Film Guild and the International Motion Picture and Lecturers Association. He is listed in Who's Who in Entertainment and he was given the "Film lecturer of the Year" award by the International Platform Association for his outstanding work in the field of travelogue production.